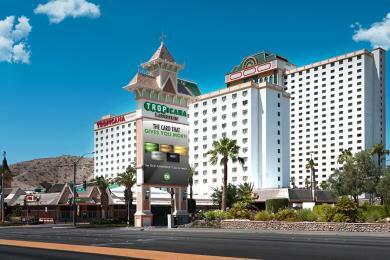 The Tropicana Laughlin Cinco De Mayo Celebration & Car Show weekend features Latin inspired music, dance parties and a wide variety of custom cars. Book your Cinco De Mayo weekend today with the Special Room, Show, Car Entry Package of $ 283.48 plus tax & fees. Package includes 2 night stay, Friday & Saturday, May 3 & 4, 2019 (add Thursday, May 2 or Sunday, May 5 for free); welcome gift for car show participants only; one car entry; two Pavilion Theater show tickets (choice of Friday or Saturday entertainment). Friday Pavilion Theater: Cannibal & the Headhunters. Saturday Pavilion Theater: Latin Ladies Live Starring Adelaide. 8pm each night. Ask for Promo 8004 for Room, Car Entry and Friday Pavilion Tickets. Ask for Promo 8005 for Room, Car Entry and Saturday Pavilion Tickets. Based on double occupancy. Call 1-800-343-4533 to book today.